"Shea Moisture Jamaican Black Castor Oil Strengthen, Grow & Restore Shampoo 16.3oz"
I created a shampoo instead of just a rinse so you can actually clean your hair as well as rice water working its magic on your hair and scalp and the conditioner to condition or deep condition the hair letting it sit on your hair to work its magic. Formulated for thick, curly type 4 hair, however perfect for any curl pattern. She knew the importance of knowing what is in your products and wanted to create healthier options for the whole family. Up for sale is a 3-step introductory kit from DevaCurl. These contain various extracts and other ingredients. 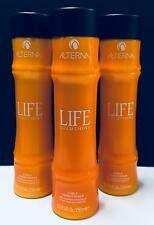 There is a conditioning cleanser, a creamy daily conditioner and a light defining gel. This would be great for travel. Herbaceous Scent: Infused With A Lush And Refreshing Scent Of Lemongrass. Life Solutions Curls Conditioner by Alterna. 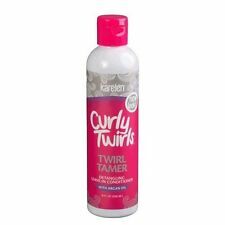 - Enhances The Condition & Manageability Of Curls By Repairing. Trending at $21.26eBay determines this price through a machine learned model of the product's sale prices within the last 90 days. For defining natural curls. Lightweight LOVE/curl cream. Product TypeStandard Hair Conditioners. AVEDA BE CURLY CURL ENHANCER 6.7 OZ. Hair One Argan Oil cleanses and conditions to improve the overall health of your hair. Rinse hair thoroughly for at least 1 minute. Massage vigorously into scalp for 2-3 minutes. Then add an extra splash of water to help evenly distribute through the ends. JAMAICAN BLACK CASTOR OIL. Contains Shea Butter, Peppermint and Keratin. Shea Butter. with Shea Butter, Peppermint & Keratin. LEAVE IN CONDITIONER 16oz. A reparative leave-in conditioner that softens and detangles hair. LOT 3 DEVACURL TRAVEL SIZES Buildup Buster ~Deep Sea Repair ~ Melt into Moisture. Condition is New. Shipped with USPS First Class Package. Shampoo and Conditioner Set (13 oz each). Heals and Hydrates Dry Hair, Leaving it Soft and Smooth. Natural and Certified Organic Ingredients. 100% authentic, fresh & new. UPC: 885662221730 787461789209 710912523619 885917073992. Kevin Murphy Luxury Rinse Conditioner For Coarse & Curly Hair 8.4 Fl. Oz. Kevin Murphy Luxury Rinse Conditioner For Coarse & Curly Hair 8.4 Fl. Oz.. Condition is New & sealed Shipped with USPS First Class Package. 5 oz. Redken Fresh Curls Curl Boost Scrunching Spray Gel. For Curly Hair. 150ml. You Will Receive A New 5 oz. 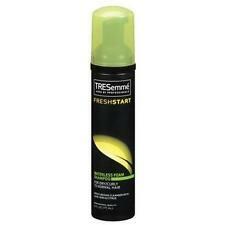 (150ml) Redken Fresh Curls Curl Boost Scrunching Spray Gel. For Curly Hair. All Our Products Are New & Authentic. Matrix Biolage SmoothProof Shampoo for Frizzy Hair 33.8 oz. This is a real authentic hair salon Matrix Biolage Product. hair salon. La Crema para Peinar Sedal Rizos Obedientes da forma a tu cabello, mientras lo suaviza y protege. La línea Sedal Rizos Obedientes reduce el Frizz del cabello, comparado con shampoo sin agentes acondicionadores. Curls will be stronger and more shapely. 2 TRESemme Flawless Curls Shampoo & Conditioner, Vitamin B1, 1 of Each, 28 oz. 1 Shampoo, 1 Conditioner, 28 oz. 1 Bottle of Shampoo. 1 Bottle of Conditioner. Gentle enough for daily use. Curl hydration for curly or wavy hair. FOR CURLY FRIZZY UNRULY HAIR. SMOOTHING SHAMPOO 12 OZ. We specialize in hard to find and discontinued product lines. Ultra creamy instant conditioner. Keep curls shiny and manageable with this ultra-creamy super rich conditioner. Scented with Lemon Grass. For all hair types. Trending at $13.95eBay determines this price through a machine learned model of the product's sale prices within the last 90 days. It evens hair that has dual textures. Formula #2 is designed for high-lift tinted and highlighted hair. Trending at $22.00eBay determines this price through a machine learned model of the product's sale prices within the last 90 days. What it does: Formulated certified organic blueberry extract, coconut oil, grapeseed oil and mango butter. What else you need to know: Proanthocyanidins, the plant chemical found in blueberries, interacts with hair follicles to accelerate growth and slow down hair graying and loss. Our curly girls with thicker, fuller textures wanted a product that added more definition and could be used with more styling techniques. Leave-in and heat style as desired. You Have Finally Found the Ultimate Curl Cream! You Are Going To Love Your Beautiful, Soft, Natural Looking, and Frizz Free Curls. It Eliminates Frizz and provides the Perfect Combination of Hold, Smoothing, and Shine to give you Beautiful, Healthy looking, Bouncy curls. You Will Receive aNew Rusk Keratin anti curl kerashine conditioning # 3. We here at "BEAUTY FROM ABOVE" specialize in all your latest beauty salon products. IT WILL GET THERE. Gentle cleansing. Distribute evenly from the scalp to ends. Leave on 2-3 minutes. Emulsify with a little water. Rinse thoroughly. All OF OUR PRODUCTS ARE 100% AUTHENTIC. No silicone. DEVACURL - ONE CONDITION ORIGINAL DAILY CREAM CONDITION - 12 OZ - 100% ORIGINAL - NEW. A cleansing conditioner that gently removes impurities, cleansing and nourishing hair while helping to achieve shape and curl definition. This conditioner is sulfate and silicone-free and adds hydration back into hair helping to define curls and easily detangle. The mild lather is great for a thorough, yet gentle cleanse. It brings out the beauty of your natural waves. The balanced, light formula cleanses the scalp and hair while fighting frizz and oiliness. Trending at $57.99eBay determines this price through a machine learned model of the product's sale prices within the last 90 days. Mixed Chicks Quad Pack -- BRAND NEW IN BOX & FRESH - FREE EXPEDITED SHIPPING! Mixed Chicks Deep Conditioner, 8 Oz : Water, Cetearyl Alcohol, Behentrimonium Chloride, Glycerin, Amodeimthicone, Cetyl Alcohol, Dicetyldimonium Chloride, Iodopropynyl Butylcarbamate, C14-18, Benzoic Acid, Glycereth-2 Cocoate, Sodium Benzoate, Fragrance. AVEDA ~ HAIR BE CURLY CURL ENHANCER BB is a part of Aveda’s line of hair care products for curly hair. This curl enhancer uses aloe and wheat protein to make curls even more pronounced while smoothing down flyaways and giving hair a healthy shine. EEOuidad 12 Minute Deep Treatment Intensive Repair 8.5 oz Curly Hair used 1x. Condition is Used. Shipped with USPS First Class Package. Moringa Oil. Shea Butter. Directions: Apply to wet hair, massage into lather, focus on scalp, rinse thoroughly. Strengthens hair follicles with minerals and vitamins. Amika Velveteen Dream Smoothing Conditioner smoothes and protects hair so humidity can’t undo what you’ve done to your ‘do. Ouidad Moisture Lock Leave-in Conditioner 8.5 oz %7c New %7c Free Shipping! Ouidad Curl Quencher Moisturizing Conditioner 33.8 oz. Mizani True Textures Style Refresher Milk 8.5 fl. oz.